Humans arrange themselves into scale-free networks to give themselves a competitive edge according to research published this month in Nature: Scientific Report. The work conducted by University of Sydney researchers expands on the work done by famous game theorist John Nash by considering the limitations to human logical thinking and modelling human societies as networks. Dr Mahendra Piraveenan, senior author on the paper "Emergence of scale-free characteristics in socio-ecological systems with bounded rationality" says scientists have known for a decade that human interact in patterns, both online and offline resembling scale-free networks, but researchers are just now asking why and how. "Understanding why scale-free networks evolved in human societies is important to understanding how to affect better decision making processes at community level " says Dr Piraveenan a complex systems scholar. Being arranged in scale-free networks has given societies a competitive advantage in situations like war, competition for food and other resources, or natural disasters, and the like. It makes the society relatively more rational, and is so doing more robust and sustainable. This may be an explanation why so many scale-free structures are found in social systems," Piraveenan states. "Scale-free networks include many "well-connected" nodes, hubs of connectivity that shape the way a network operates. The nodes within this network aren't necessarily random or evenly connected. But the ratio of well-connected nodes to the number of nodes in the rest of the network remains the same regardless, even if the network changes in size " he explains. "Humans may have evolved into scale-free structures to provide more rational responses to emergencies such as infection epidemics or natural disasters. When a society is structured as a scale-free network it responds more rationally to threats even when individuals in the society have not had time to gather information about a disease or disaster," Dr Piraveenan explains. 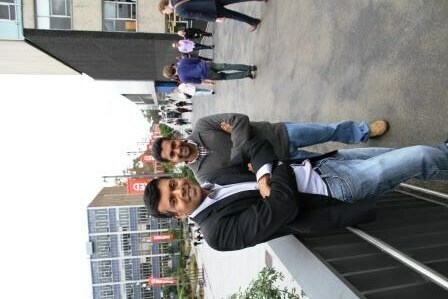 The paper 's co-authored by Ph.D. candidate Dharshana Kasthuriratne says scientists have discovered that networks of human interactions, whether in online forums such as Facebook or LinkedIn, or offline networks such as friends in a school, or a network of people in a certain business show this 'scale-free' feature. Piraveenan and Kasthuriratne 's study simulated the decision making process of communities of thousands of people inside large distributed computing systems, such as computing clusters.
" We applied 'evolutionary pressure ' to these initially random interaction networks, by rewarding participating communities if they showed higher systemic rationality, and the random interaction networks were allowed to re-wire while keeping the total number of links constant, " says Piraveenan. "Results of the simulation showed scale-free networks emerging from initially random networks of people, Dharshana says. "Scientists know that many real-world socio-ecological systems display the 'scale-free ' feature, and our work provides an explanation of why these networks are so prevalent." "We believe that humans organise themselves into free-scale networks so they can interact more effectively. It has been vital to our survival as a species. It is possible to argue that those human societies which organise themselves into scale-free structures have had an advantage over the societies which did not," suggests Dharshana.